On the small screen it will be easier to shrug off this movie's nagging problems and get in the swing of it. Worth renting, if not owning. This has never happened to me in a movie before: There I was, ignoring a host of petty quibbles and enjoying the heck out of the unabashed comic-bookish cool of Sam Raimi's summer blockbuster "Spider-Man" adaptation -- then the second the credits rolled, I was overwhelmed by a feeling of bitter disappointment. Why? Because with the candy-like taste of it fading faster than 25-cent bubble gum, I realized this is a throwaway movie that won't stand the test of time. It's a trifle -- nothing more than a fleeting piece of 2002 pop culture for teenage boys that down the road will seem as dated and dopey as the 1989 "Batman" has become and the 1978 "Superman" has been for a long time. I expected more from Raimi, whose gift for great cheese (e.g. the "Evil Dead" movies) seems to have been suppressed here by commercial concerns (beyond selling soundtrack CDs, what purpose does it serve to have a performance cameo by hip-pop star Macy Gray?) and by an evangelical adherence to what might be called the Marvel Comics Movie Adaptation Handbook. "Spidey" starts very strong, with picked-on high school nerd Peter Parker (Tobey Maguire) pining away for his next door neighbor, the beautiful Mary Jane Watson (Kirsten Dunst). On a field trip to a Columbia University lab, Peter is bitten by a genetically altered super-spider and wakes up the next morning more buff, more bold and bestowed with incredible strength, dexterity and an ability to sense danger around him. Oh yeah, and there are wall-gripping micro-hairs growing from his fingertips and glands on his wrists that shoot spider webs (a slight alteration from the comic, in which Parker built his web-shooters). 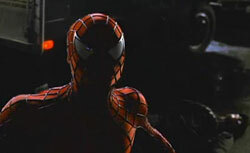 Raimi couldn't have chosen a better young actor than Maguire for the role of Peter Parker, who unlike many superheroes is not a charming stud when he's off-duty. His reserved, contemplative performance style personifies all the insecurities and frustrations that have always been an important component of the character's backstory. When Peter moves to New York to begin his life as Spider-Man (while still learning to adjust to his new powers), Maguire plays masterfully his growing self-confidence and sense of purpose. 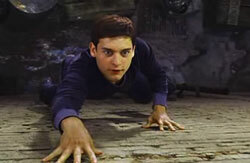 In fact, the casting of "Spider-Man" is perfect across the board. Besides being a damsel in distress, Dunst gets to play a genuine character arc in which Mary Jane gets out from under her abusive father's roof. She struggles with life on her own in the big city and begins to develop a sense of self that doesn't require being validated by sports-stud bully boyfriends. It isn't long before she recognizes that a sweet, quiet guy like Peter Parker might make better relationship material. J.K. Simmons ("The Mexican") steals several scenes as the vein-popping, cigar-chomping editor of the Daily Bugle, where Peter becomes a photographer after capturing front-page worthy pictures of Spidey (by putting his camera in a web and on a self-timer just before roughing up some criminal types). And you could not find a more ideal actor to play the Green Goblin than Willem Dafoe, who looks like the Green Goblin even out of his exoskeleton armor and off of his heavily-armed, sky-surfing glider, when he's just millionaire defense contractor Norman Osborn. As Osborn is driven slowly mad by an experimental dose of his company's own "human performance enhancement" drug, Dafoe sinks his teeth into a couple split-personality arguments with himself that reveal a real struggle for his soul while still providing for plenty of bad guy scenery chewing. But with the introduction of the Green Goblin, "Spider-Man" begins to resemble its fading superhero flick predecessors, right down to the supervillain's terrorizing debut at a parade that includes giant cartoon balloons floating overhead ("Batman" deja vu, anyone?) and the invasive, saturating and too-familiar score by Danny Elfman ("Batman" deja vu, anyone?). What happened to the fantastic theme music from the trailers and TV spots? "Spider-Man" has the goods where it counts: The web slinging and swinging are Spidey-rific -- exciting and completely true to the comic books in style and execution, even if the CGI effects are occasionally a little too obvious. And the film is at its best when Raimi breaks out of the Marvel mold and slips in some of his trademark tongue-in-cheekiness. Could there be anything more intentionally corny than the Green Goblin cackling "We'll meet again, Spider-Man!"? Could Peter's photos of Spidey look a little fake on purpose because he works for a tabloid? Could any other director have pulled off a funny interview segment with cynical New Yorkers weighing in on the arrival of a superhero in their midst? How much fun is that Superman homage in which Peter runs down an alley on his way to stop a crime, pulling his shirt open to reveal the superhero logo on his chest? But even with everything I liked about "Spider-Man," what this review comes down to is this: I downloaded that trailer I mentioned off the web some time ago, and I'm planning to keep it for good. But when the movie comes out on DVD? No thanks. Not interested.